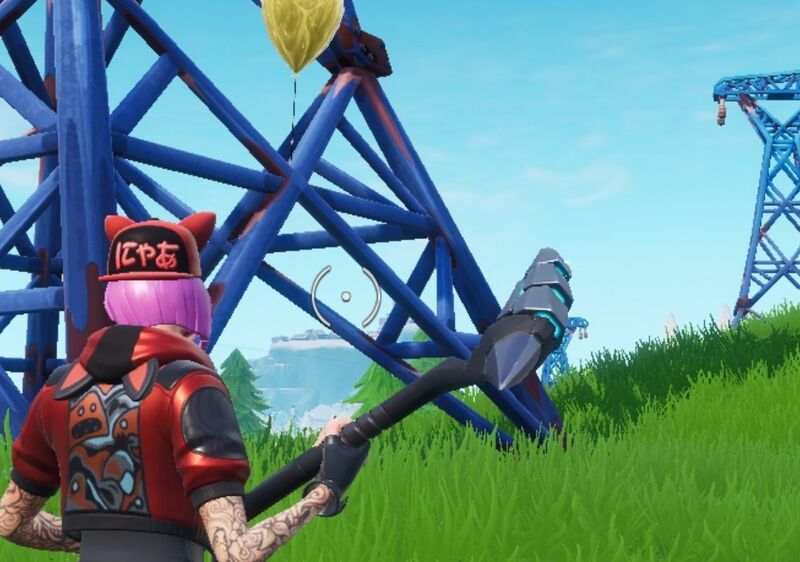 Struggling with the Golden Balloons in Fortnite Season 7? Don't worry, we got you. Fortnite Season 7, Week 9 is a meaty week for involved challenges. Three of the seven challenges this week are all involved enough to warrant individual articles. If you’re looking for guides on the Stormwing Timed Trials, you can find that here. If you’re after the three landmarks you need to dance on, you can find their locations here. This article focuses on the locations of the ‘Golden Balloons’ so you can pop em’. This challenge is probably as simple as they come: find a balloon and pop the balloon. You can pop as many as you want in a single match, but you can only pop the same balloon once. Put differently, once you receive credit for popping a balloon, that’s it, you have to find another, because it will no longer respawn for you. To pop a balloon, you simply have to damage it. A pickaxe will do, but a gun is (despite the sound) probably a little safer as you don’t have to get so close to them, because don’t forget, other people want credit for their challenge as well. It appears that if someone pops the balloon in front of you, it won’t respawn, which was the case for me at least, which is exceptionally odd — Epic rarely makes their challenges this way. With that in mind, it might be easier to land somewhere off the beaten path (away from the Battle Bus’ route) and try to pop as many Golden Balloons as you can in that location before the rampaging horde makes its way over. Below is the map of all the locations we could find, along with screenshots of each location. Remember, there is more balloons than ten (we found 12) on the map, so pick those that are most convenient for you. Finally it is worth repeating: it appears each balloon can only be popped once per match and that’s by anyone (unsure if intended or bug though, so it might be fixed). So if you do go to one of these locations and can’t find the Golden Balloon, it means someone has already popped it and you’ll have to try for this one in another match. As you can see, they’re all spread about the map, and as stated above, you only really get a shot at one per match, so it’s best to plan your landing as soon as you load into the waiting island. You’ll find this Golden Balloon smack bang in the centre of Dusty Divot’s central crater building. Just land on the roof and you’ll find it tied to the southwestern corner of the building’s roof. You’ll find this on the intersecting grid coordinates of F5, F6, G5 and G6. You’ll find this Balloon smack centre of Fatal Fields. There is a large path that runs north-south along the guts of the farm, the balloon is tied near the top of the windmill on the east side of this path. G8 on the main map’s grid. On the runway of Frosty Flights is a small information board about halfway along it, the Golden Balloon is tied to this board. Found on the intersection of A8 and B8 on the main map’s grid. Not strictly near Happy Hamlet, being about equidistant from both Happy Hamlet and Frosty Flights. To the west of Happy Hamlet (southeast of Frosty Flights), you’ll find a small forest with a hole in the centre. This hole leads down into what looks like a ‘secret base’ of sorts. Down here you’ll find a small wooden structure with the entrance boarded up, break the boards and you’ll see the Balloon tied to the hand of a stuffed bear. B9 on the main map’s grid. You’ll find this Balloon on the western side of the cemetery, on the roof of a mausoleum. B2 on the main map’s grid. To the northeast, there will be a small peninsula overlooking the ocean with a rock formation resting near the tip. G2 on the main map’s grid. This one also isn’t found at Lazy Links, but you will find it directly west of Lazy Links at the dilapidated motel. The Balloon will be on the motel’s toppled entrance sign, where the O would be in Motel. You’ll find it on the intersection of D2 and E2 on the main map’s grid. Just on the southwestern border of Lucky Landing is a steep hill, before the sharp off into the ocean. Just on the other side of this hill is the Balloon (it’s near the L in Lucky Landing on the map). F10 on the main map’s grid. Whilst not located in Paradise Palms in earnest, it is fairly close. Directly to the east of Paradise Palms is a small house and fields, the Balloon is tied an old wagon in the field. J8 on the main map’s grid. To the southeast of Retail Row is a brown statue of a bear playing a wind instrument of sorts (I wouldn’t know what kind, I’m musically challenged). Tied to its backpack is the Golden Balloon. You’ll find it on the border of H6 and I6 on the main map’s grid. To the northwest of Retail Row, across the valley is a shipping yard. Directly to the south of this shipping yard is an electricity tower with the Balloon tied about a third of the way up it. H5 on the main map’s grid. To the northeast of Wailing Woods near the cliff face overlooking the ocean is a large brick house. At the very top of this house’s tower like structure you’ll find the balloon tether to the roof. Located at the intersection of I2 and J2 on the main map’s grid. This challenge while straightforward in expectations, is very time consuming. It’s especially bad when you’re limited to a single balloon per match as by the time you pop your first one (assuming you managed to beat out the competition), the others have likely been popped by another player. Whether this is intended or an oversight by Epic is yet to be seen, but it does run contrary to their usual design regarding these things. If you’re looking for our articles on the other two involved challenges, we linked them at the beginning of the article, if you’re looking for our usual weekly overview, you can find that here. Regardless, enjoy having your having Golden Balloons snatched before your very eyes.